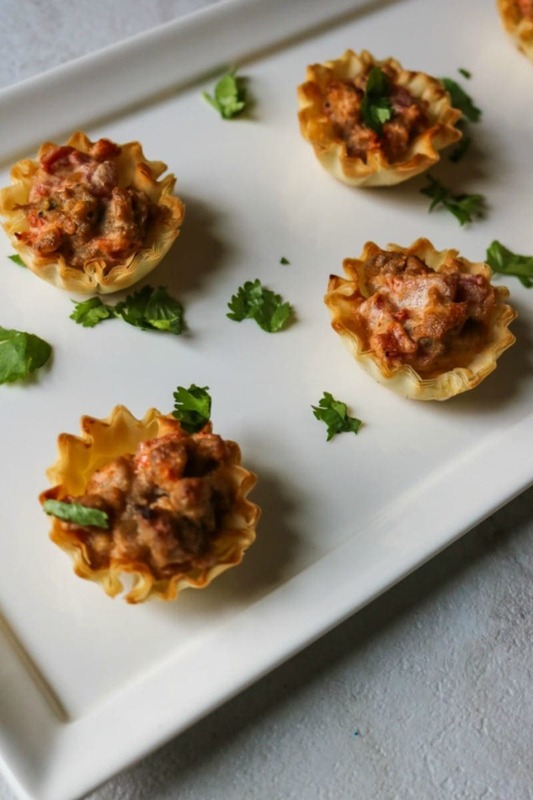 Spicy Sausage Cups: A simple 4 ingredient easy appetizer recipe that tastes like a creamy taco dip, but presented in a much more elegant fashion. Perfect to make-ahead as well and freeze for last minute party guests as well. Growing up, my family always had Peppys for Christmas breakfast. What are Peppys, you ask? They are mini pumpernickel toasts spread with a mixture of sausage and velveeta cheese and then broiled to perfection. And oh, I love them. They are a childhood memory for me and something to this day, I would not be able to pass up this creamy sausage tart up. While I loved the sausage toasts my mom made, I do not love the ingredients they are made from, and my family instead has Overnight Skinny Cinnamon Rolls and a Sausage Hashbrown casserole instead for our Christmas Breakfast. I discovered a party dip a few years back that tasted a lot like my beloved Peppys. When I found out how easy this was to make–sausage browned up with rotel and cream cheese, I was blown away and that party dip, inspired this appetizer taco bite. And after playing with a few varieties of sausages, I discovered that a lean organic chicken sausage worked perfectly in the recipe for the spicy sausage mixture. And instead of serving with chips or pumpernickel toasts, I opted for mini phyllo cups–for presentation factor. 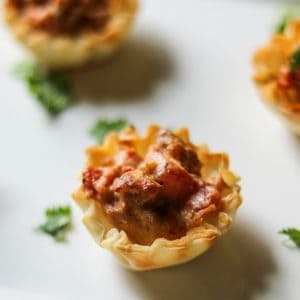 Phyllo cups created the perfect bite size appetizer and even allowed this simple dip to appear somewhat elegant–but baked wonton cups, like I use in my Taco Cups or even pumpernickel toasts all are options for serving this creamy rotel sausage dip on. I mean seriously–don’t these sausage cups look cute? Not to mention, they are the perfect way to look classy while secretly stuffing your face full of taco dip. Start by browning up your favorite sausage. I used a nitrate and MSG free chicken breakfast sausage, but you can use ANY ground sausage you’d like. Add in a can of tomatoes with diced chiles (AKA rotel tomatoes) and half a block of cream cheese into the skillet. Cook on medium heat until the cream cheese has melted into the rotel tomatoes and the sausage dip is warmed through. Scoop into the mini phyllo cups. Did I mention these are best to make ahead of time, assemble, and freeze to pull out as needed? 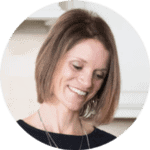 A hostess’ (or host’s) dream come true! 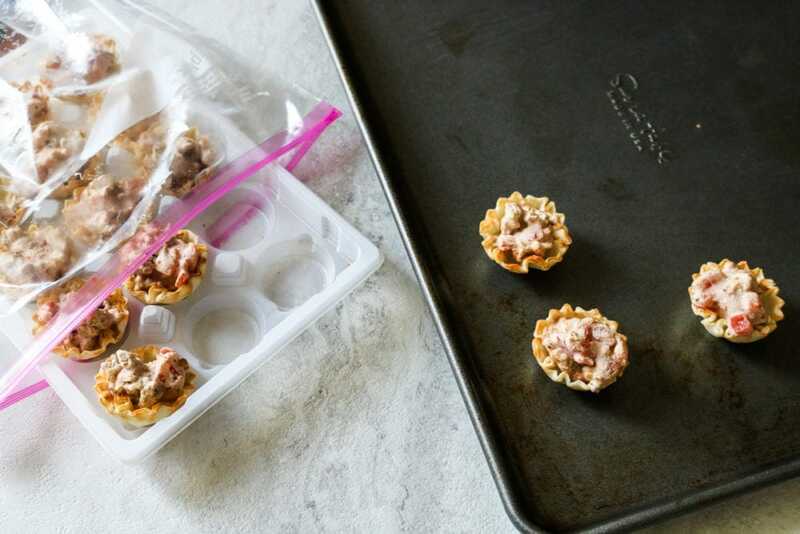 I keep these turkey sausage cups in the carton that the mini phyllo cups come in and pop in a freezer bag and stick in my freezer. When guests show up, I just pop them into the oven and warm through and serve–making entertaining look effortless. I use chicken or turkey spicy sausage for this recipe. You can use any ground spicy sausage you would like. I would not recommend using fat free cream cheese for this sausage rotel dip–it could get a bit watery when cooked and will not freeze well. Low fat or full fat cream cheese both work perfectly. If you don’t have rotel tomatoes, you can use 1 1/3 cups of salsa in place of the diced tomatoes with chiles–it is equally delicious. 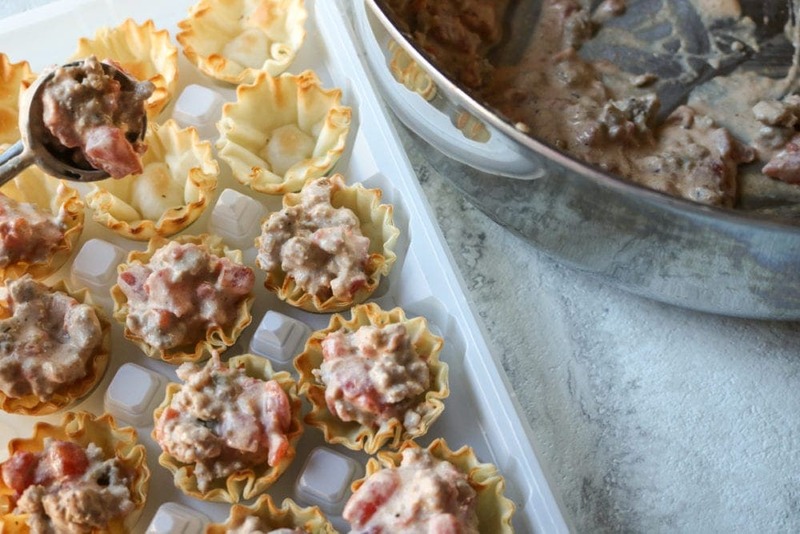 I love to use the phyllo cups to serve the Rotel Sausauge Dip in, but baked wonton cups or even scoop tortilla chips would work (just note that the tortilla chips could get soggy if not serving right away. 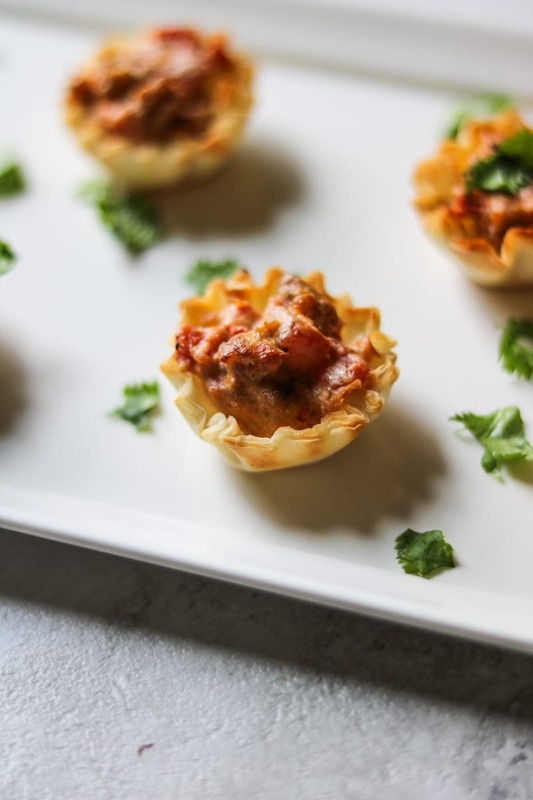 These mini sausage tarts are the perfect little bite–filled with fiery flavor that is calmed down from the cream cheese. It is a party for your mouth and perfect for any party any time of the year! A creamy, lightened up rotel taco dip is given an elegant presentation by being served in mini phyllo cups. Brown sausage and drain away any excess grease. Add in diced tomatoes and cream cheese and stir until heated through and cream cheese is evenly incorporated into mixture. Allow sausage mixture to cool slightly and then fill each phyllo cup with 1 tablespoon of the sausage mixture. At this point either bake at 400 degrees until browned, about 10 minutes, or freeze. From freezer, place on baking sheet and bake at 400 degrees for 18-20 minutes at 400 degrees, until cooked through and browned. I’ve heard of Peppy’s called Hankie Pankies and Polish Mistakes. I love them so I can’t wait to try this lighter version. Yum! These DO sound amazing!!! And I love that you put them back into the packaging and freeze for later. Brilliant!! I love how you kicked the flavor up a notch! These do pack a flavor punch! 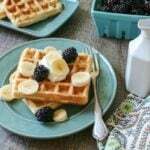 Tasty flavors and love how easy these are! Delicious party dish, would love to try them! 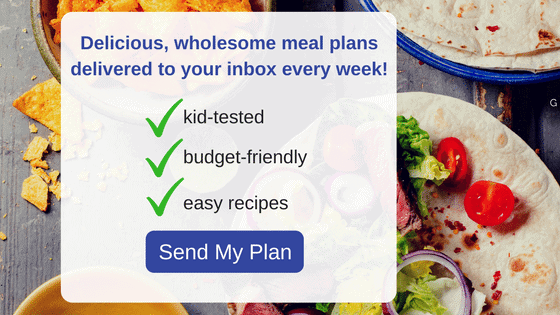 These are so easy David, I hope you do give them a try! You can never go wrong with anything in phyllo dough. So deliciously crispy. Never 😉 Add in sausage and WOW!!! Cute idea for phyllo cups! So easy!